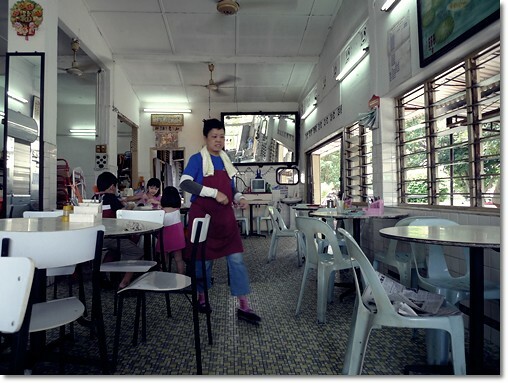 Tasek; an enclave of industrial haven located in between Bercham and Chemor won’t probably trigger your mind upon the onset of hunger pangs; for I myself have been struggling to recommend a really good place for people to dine at after visiting Perak Cave along Jalan Kuala Kangsar. 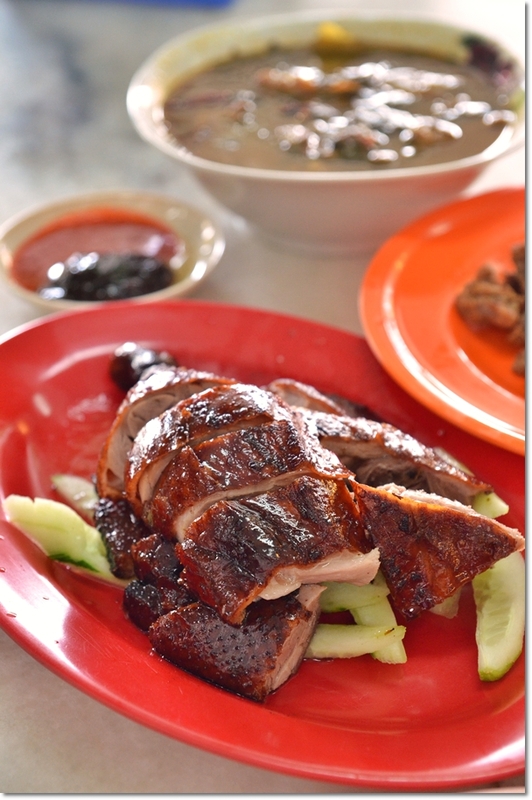 But then, have you chanced upon this really cool roast duck place named Kedai Hong Kong? Not to be confused with the previous Canning Garden one that also used to serve roast duck (but sadly, she has retired), this double lot eatery with air-conditioning actually serves more delicious gems beside roast duck. Crispy Roast Duck @ Hong Kong Restaurant, Canning Garden – Briefly bathed with boiling oil before being served (by request), this was simply a cut above the other roast duck specialists in Ipoh. Madam Heng was a persistent lady, oh yeah. Can’t deny that. It has been a year since the initial contact made between herself and her brother-in-law with myself, an acknowledgment and gratitude nods for the post published in June last year. (Read “That Famous Canning Garden Roast Duck”). As fate would have it, a full 12 months have passed before I managed to seek out the time for a revisit. 12 months of changes; seeing me moving from Ipoh to Selangor, changing my job (almost a 360 degrees paradigm shift, if you get my drift … hey that rhymes! ), and settling in comfortably at that. Well, still adapting to the upbeat pace here, in comparison to the so-named (and rightly so) ‘honeymoon years‘. 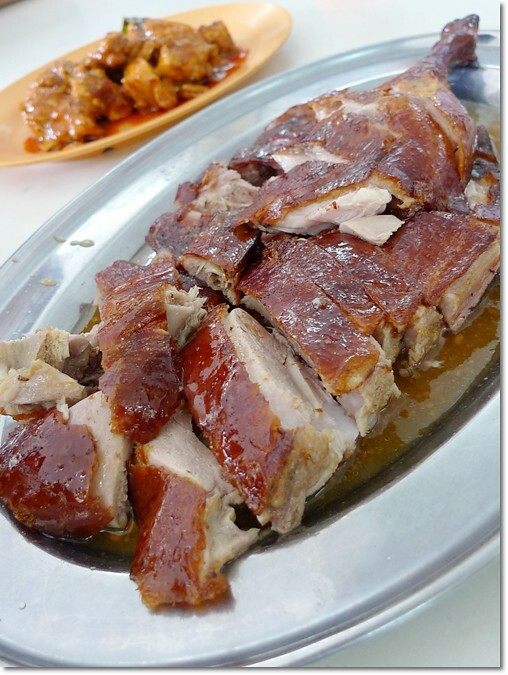 Peking Roast Duck @ Toh Yuen, PJ Hilton – In its most glorious, pre-dissected stage. Almost of perfectly unreal aesthetics, the glistening crisp and caramelized skin was first basted and glazed in a secret concoction (duh), before being roasted in the open fire oven. 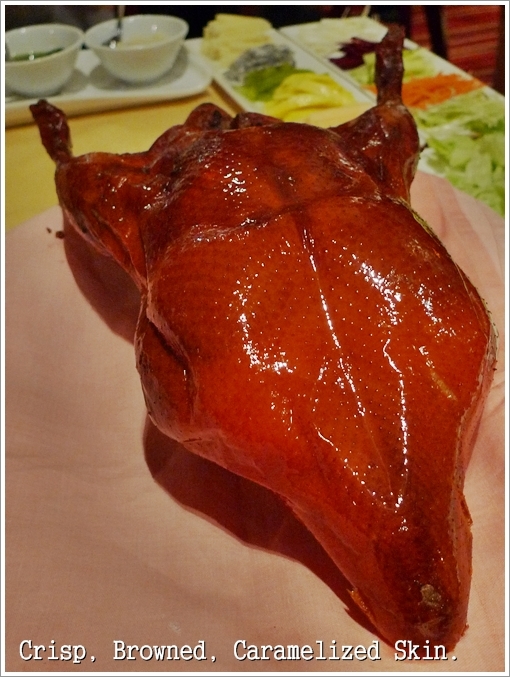 Talk about Peking Duck, and the first thing that sprang to mind was that unforgettable feast back in Beijing. But that was a good 6 years ago. Or maybe more. So much so that I have absolutely no recollection of the experience whatsoever, other than the routine carving of a very large fowl (Peking duck in its original form should be at least 3kg or more!) by the side of our table. And then there is the prerequisite of mastery in carvery; slicing up the crisp skin (almost devoid of fat now; thanks to the immense heat from the roaster) with a sliver of meat intact for texture. Followed by scrambling of warm flour pancakes (almost like fluffy tortilla bread), open up on palms, then generously picking up the julienned characters; cucumber and spring onion, but not before spreading a good spoonful of ‘hoi sin’ sauce on the base. 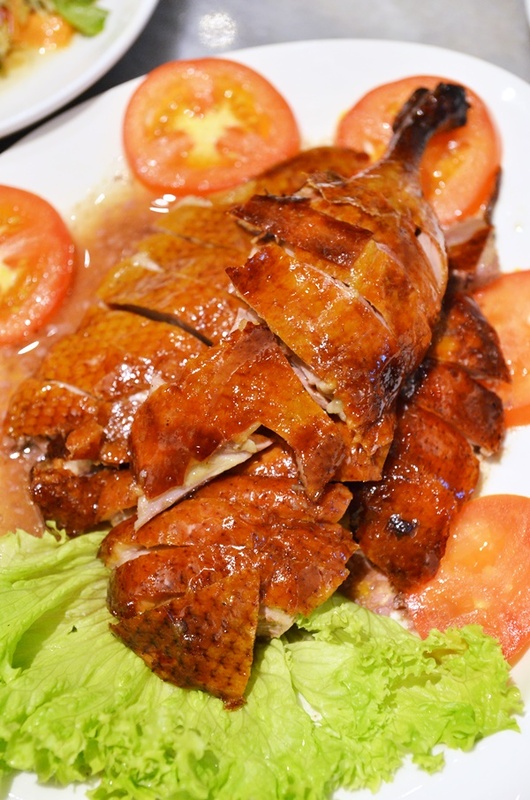 Then gingerly picking up a piece (or two) of the real deal of crispy duck skin then placing it on the bed of greens; and finally rolling up the whole ensemble and popping a mouthful (usually small enough to be downed in one-two mouthfuls) and the rest was BLISSFUL history. Epitome of a Perfect Family Feast – It does not matter whether you’re a child of 3.5 years old, an adult deep in the tribulations of life, the parents with hopes beaming and on the brink of retirement, or a great grandmother satiated and enriched with almost 9 decades of life experiences. 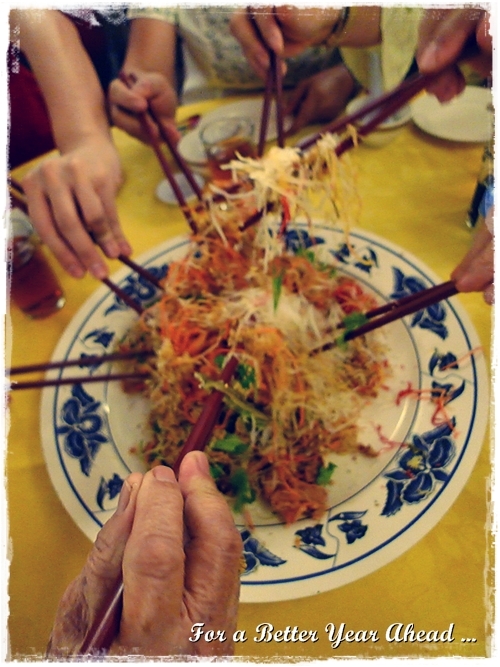 This annual “Lou Sang” tradition never gets old. Last year’s reunion dinner was half a disaster. Since we should be forgiving and forgetting the past mistakes, hiccups and trivial issues, let’s not look back. In fact, we have been dining out every year without fail, since cooking at home has become too much of a hassle. Plus, the surge in prices of fresh ingredients from the market during the days leading to the festivity. Over the years, we have dined at KFC (Kentucky Fried Chicken, in case you’re curious as to why there is a Chinese restaurant named as such), Secret Recipe, Kenny Roger’s, Pizza Hut, Kok Thai, Han City, Mun Choong, East Ocean, etc etc. 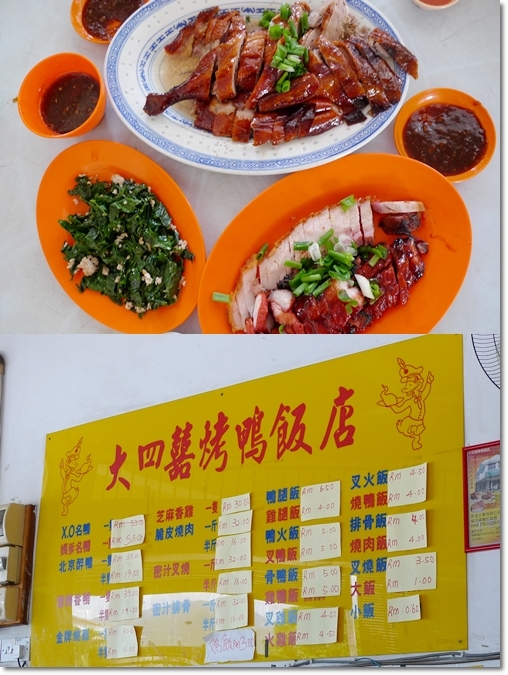 I have heard and read much about this roast duck stall in Canning Garden of Ipoh, so much so that I got a little confused over this stall, and the (almost) similar restaurant serving (almost) the same fares named Hong Kong Oil Chicken & Roast Duck Restaurant in Tasek of Ipoh. Yeah, and this stall in Canning Garden is parked within a restaurant named Hong Kong as well. Uncanny resemblance? 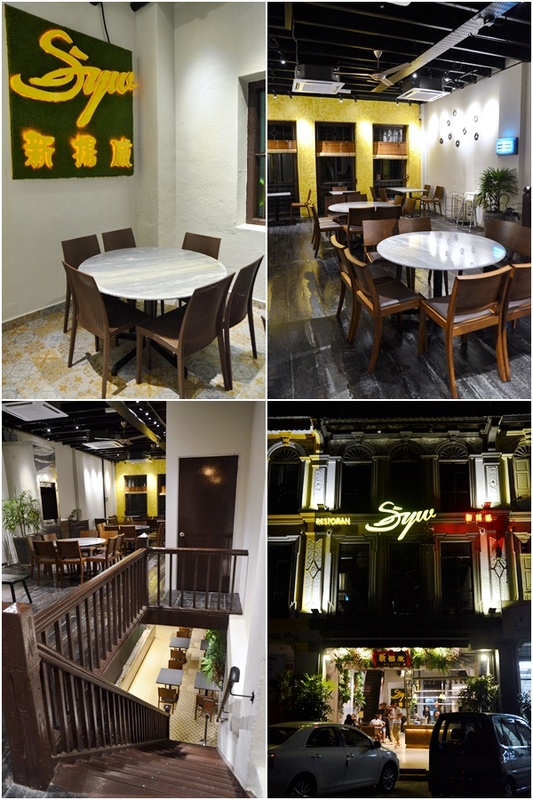 Hong Kong Restaurant @ Canning Garden, Ipoh – The same mosaic-tiled floor, mirrors and paintings on the walls, and a relaxing airy ambience with all windows and doors opened to the maximum. And so, reading Alexandra’s article AGAIN two Saturdays ago got me all worked up for a visit to this stall soon. 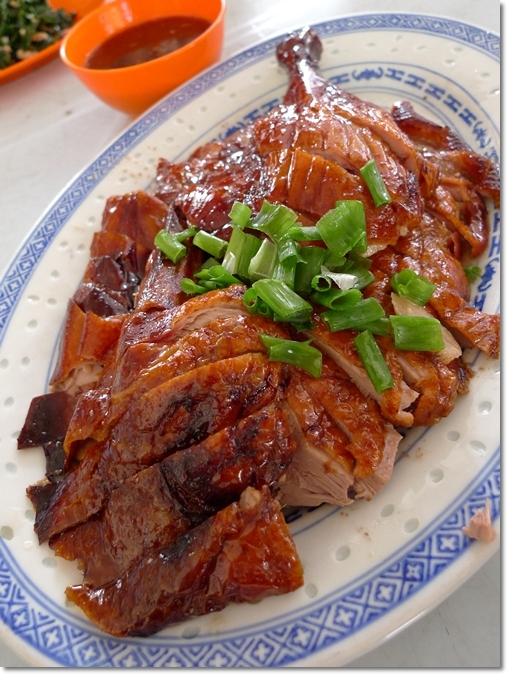 Plus I received an encouraging e-mail from a reader named Steve sometime back in May, pushing me on to give this particular crispy roast duck (“chui pei ngap”) a try. 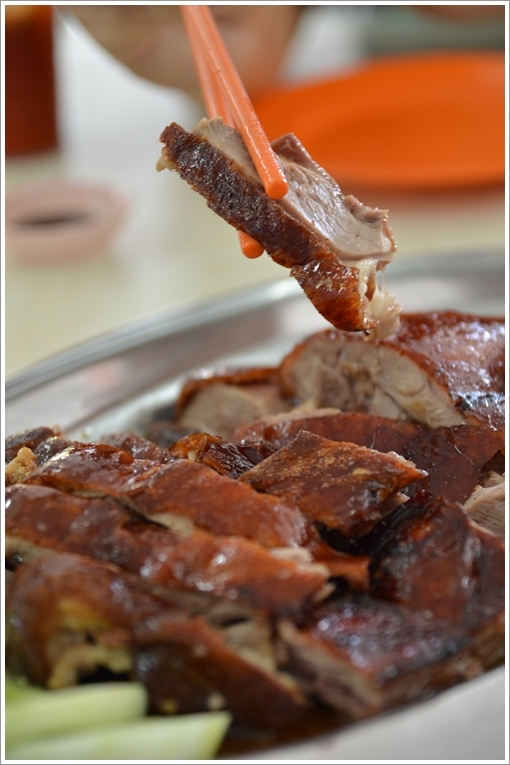 Crispy Skin Roast Duck – Half a portion for RM19/USD5.80, the glistening and crackly skin stayed crispy throughout the meal, and the juicy, tender meat was devoid of any gamey taste.